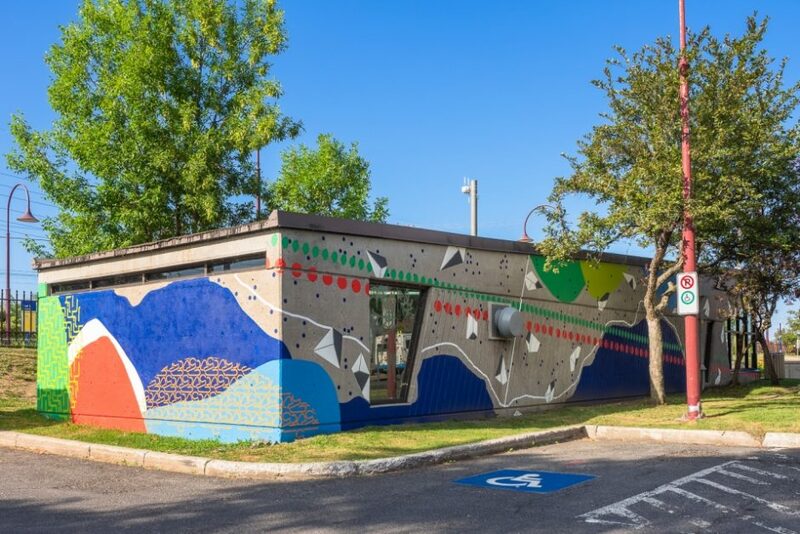 The artist Ilana Pichon was selected to produce this mural, which is located on the Valois station tunnel entrance building’s concrete walls. The tunnel entrance building serves as a pedestrian entrance to the tunnel, which connects the station’s north and south platforms. The artist’s mandate was to design a mural on the theme of transportation that highlights the history of the city, whose development is directly linked to the evolution of transportation. From the tunnel’s entrance, “L’empreinte de l’homme” (Humanity’s Footprints) takes a graphical approach, which gives it a sign-like identity in the urban space. The mural aims to energize the location, while contributing to the valorization of the city of Pointe-Claire. Spanning three panels, the mural depicts the diversity of humanity’s footprints. The first panel is constructed from elements of the geography of the surrounding area. The second reflects slower movement and evokes the idea of multiple crossings. The third is influenced by the artist’s own footprints, illustrating five methods of transportation from her perspective. The artist was assisted in the execution of the project by Marie Lemieux, Bianca Leblanc, Nikki Kuentzle and Marianne Blondeau.